We welcome new voices each season! No auditions required… If you do not know your voice part ( Soprano, Alto, Tenor, Baritone, or Bass) you may request a time with the conductor to determine where you might be most comfortable singing. Previous experience is not required, but we do work primarily from written music, so it does help to have sung with a chorus or to have played a musical instrument in the past. 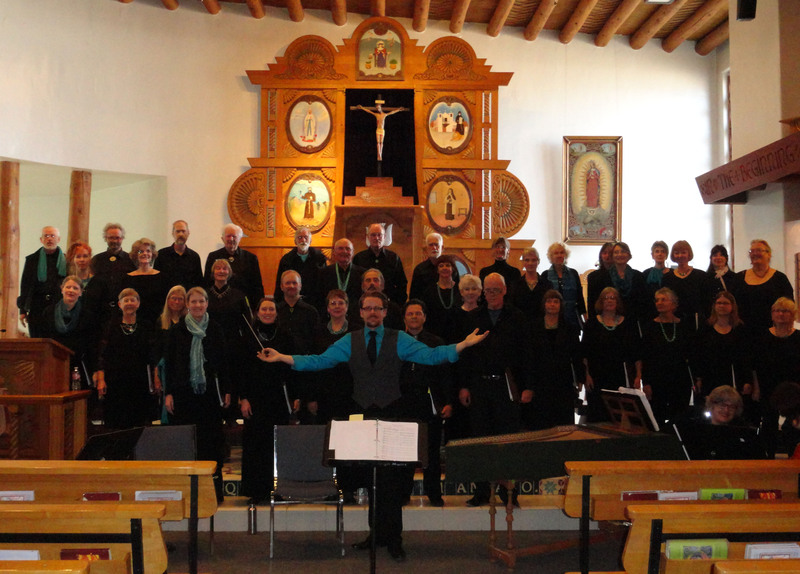 Rehearsals are Monday evenings from 6:30 – 9 pm at First Presbyterian Church of Taos (just north of Kit Carson Park) 215 Paseo Del Pueblo Norte, Taos, NM 87571. The rehearsals are for twelve weeks plus one added Thursday night dress rehearsal. All members are expected to work on music outside of rehearsals. We do our best to provide recordings of the music to be performed each season, either via online or via CD, as well as making our members aware of other learning support. Membership fees per season: $65.00 adults and $35.00 for students to cover the cost of printed music. Scholarships are available for anyone who has a need. NO ONE WILL BE TURNED AWAY FOR LACK OF FUNDS.